Where I Am Now: Happy Summer! I realize that the first day of summer was a couple of weeks ago. But I'm just now getting around to uploading photos I've taken recently and this one seems like one worth sharing. Not because it is an outstanding photo necessarily, but because it captures a somewhat historic event. This shot was taken at Solstice Park in West Seattle at sunset on June 21, 2011. The park was created a few years ago as a place to witness and celebrate the sun's arrival at its northern and southernmost arcs across the sky. 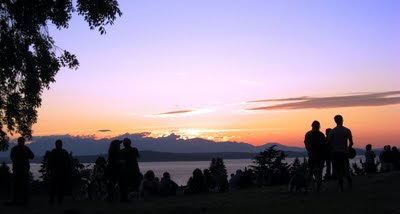 (Of course, as you can see, it is a pretty spectacular place to watch the sun set anytime, with Puget Sound and the Olympic Mountains in the foreground.) A marker was set in the park, supposedly to line up with the path of the sun on Solstice days. But because of cloud cover, the sun has not been visible at sunset on the day of the Summer Solstice since the park's creation, and no one really knew if the marker did, in fact, line up. So as the day approached, and the weather report sounded promising, we had high hopes that this would be the year to find out. As you can see, we did, indeed, have a clear view of the sunset this year. And according to Alice Enevoldson, astronomer and volunteer with NASA's Solar System Ambassadors Program, the sun did pretty much line up with the marker. Given the fact that folks around here joke that summer doesn't REALLY start in Seattle until the day after the 4th of July, I think we got off to an early start this year. And this photo is proof -- an auspicious beginning all around.